Drowning is the fifth leading cause of unintentional injury-related death in the United States. Knowing how to swim and following these safety tips will help keep you and your children safe. Explain swimming safety to children when young, and reinforce its importance regularly. Do not dive unless it’s deep enough to dive safely—it is recommended not to dive head-first in water less than nine feet deep, and not to dive at all into water less than five feet deep. If depth is not posted, ask a lifeguard. Always monitor children, even if lifeguards are present. Always review and follow posted water safety rules. 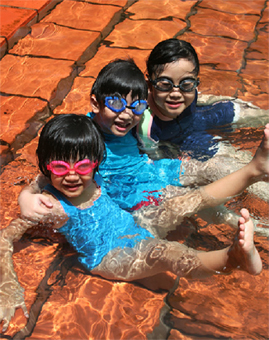 Avoid swimming alone, and make sure your child uses the buddy system if swimming with friends. Never run near a pool—slipping can be dangerous. If you are just learning to swim, stay in an area of the pool where you can stand. Pool toys are not designed to be safety flotation devices—keep life jackets or life rings close at hand. Wear water shoes to protect your feet from jagged rocks, broken bottles, trash, etc. Be careful of weeds, which can trap your feet. If you do get tangled, slowly pull and shake your arms and legs to get loose. Stay away from boats, jet skis and other motorized water vehicles. Be cautious and inch out to avoid unexpected drop-offs. Pay attention to water conditions and wave strength. If it seems unsafe, don’t go in the water. Strong currents can carry swimmers away from shore quickly. If you get caught in a current, swim parallel to the shoreline until the water stops pulling you, and then swim straight back to shore. If you cannot safely make it back, tread water and call or signal somebody for assistance. Watch out for jellyfish. If you get stung, find a lifeguard immediately to seek treatment, or call 911 if you have a severe reaction. Always swim in an area that is easily visible to others. Do not swim extremely far out. Avoid swimming close to piers and boats; if a big wave comes, you could get thrown into something and injured. Knowing your limits in the water is important. If you swim too long, you could develop a muscle cramp or other physical condition that makes it harder for you to swim safely. If you do find yourself struggling, get out of the water immediately and rest, or flag a lifeguard.